In many stepfamilies, the children divide their time between the homes of their natural parents, allowing them ample opportunities to remain bonded with the family members of both of their parents. Sometimes, though, one parent is out of the picture and in such cases, the kids are sometimes separated form that parent’s extended family. When possible, it is best for the children to have strong, healthy relationships with all of their family members, and there are steps that parents and stepparents can take to promote such bonds. Depending on the circumstances, there may be issues between family members that are prohibitive to keeping in contact, but sometimes, differences can be put aside in order to allow the children to retain contact with members of their extended families. When a substantial amount of time has been allowed to pass without communication, it can be awkward to take the first step, but after a while, the time and distance fade away, making it possible for family members to reunite for the sake for the kids. When one parent is absent from their children’s lives, whether purposefully or not, the members of that parent’s family may no longer be included in the family’s activities as they once were. By inviting them to join in on both regular gatherings and special occasion get-togethers, the children can rebuild and maintain close bonds with lost family members. In most cases, both the kids and the members of their extended families are grateful for the relationships. Stepparents typically take an active role in the daily lives of their stepchildren, helping them with everything from schoolwork to providing transport to their activities. Because they are such an important part of their stepchildren’s lives, stepparents often have a great deal of influence on the kids, making their opinions some of those that are most valued. When stepparents encourage their spouses to retain contact with the family of their absent ex so that the children can get to know all of the members of their families, the children’s parent is likely to listen and heed the advice. Unless there are good reasons for keeping family members away from the kids, such as histories of abuse or neglect, children should be afforded the chance to know their relatives. In some cases, it is by the wishes of the absent parent’s family members that contact is lost, but even then, there are steps that parents and stepparents can take to help the children feel connected to their other parent. Talking openly about the best traits of the absent parent, recalling shared memories, and honouring the memory of a deceased parent by acknowledging birthdays or other special days are all ways in which children can be helped to feel a sense of connectedness to those no longer in their lives. Good parents and stepparents do quite a number of things for the benefit of their children, many of which are difficult or uncomfortable. Keeping the kids in touch with the family members of an absent parent may fall into this category, but in the long run, parents find the results to be well worth the effort when they see their children happily interacting with the other half of their families. Hello.I am a step mother and now step grand mother for the last 27 or so years.I had chosen not to have bio children of my own (for various reasons. )I would like to just give a bit of background and make a comment. My step kids are now a woman 33 and a man 34. My husband ( their bio dad) and I had raised them full time in our home for about 18 or 19 years. Their bio Mom,for unknown reasons, had very little contact with them when they were growing up. She spent her time pursuing higher education and traveling and has also remarried. It has only been in the last 4 to 5 years that Bio Mom chose to come back into the lives of her Bio children. As mentioned earlier, the "children " adults now are 33 year old women who now has a 4 year old daughter. As well as a 34 year old man who has a 2 year old daughter and a 8 month old son. The 33 year old women and the 4 year old daughter are now living in our home full time. I did the best I could to raise the now 33 and 34 year old. Now that bio Mom is back in their lives in the last 5 years, they want very little if anything to do with me. The only child I am closest to is the 4 year old daughter.my step grand daughter.she is the love of my life and we have a strong bond. I know this is likely because she lives in my home.Step parenting.as well as parenting. can sometimes be a thankless job. I have learned to never expect anything in return.I only thank god that I was raised in a 2 parent loving family ! Many thanks for your interesting comments. Of course people have many different experiences of raising step-children, some succesful and some unsuccesful and some in between. 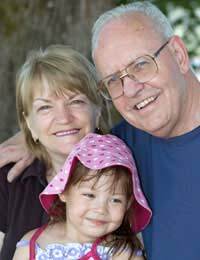 We are glad that you at least have a bond with your step-grandchild and that this has been worth the difficulties you have faced with your step-children. Hello.. I am a step mother and now step grand mother for the last 27 or so years. I had chosen not to have bio children of my own (for various reasons.) I would like to just give a bit of background and make a comment. My step kids are nowa woman 33 and a man 34. My husband ( their bio dad)and I had raised them full time in our home for about 18 or 19 years. Their bio Mom,for unknown reasons,had very little contact with them when they were growing up. She spent her time pursuing higher education and traveling and has also remarried. It has only been in the last 4 to 5 years that Bio Mom chose to come back into the lives of her Bio children. As mentioned earlier,the "children " adults now are 33 year old women who now has a 4 year old daughter.As well as a 34 year old man who has a 2 year old daughter and a 8 month old son . The 33 year old women and the 4 year old daughter are now living in our home full time. I did the best I could to raise the now 33 and 34 year old. Now that bio Mom is back in their lives in the last 5 years, they want very little if anything to do with me. The only child I am closest to is the 4 year old daughter. .my step grand daughter. .she is the love of my life and we have a strong bond. I know this is likely because she lives in my home. Step parenting ...as well as parenting... can sometimes be a thankless job. I have learned to never expect anything in return. I only thank god that I was raised in a 2 parent loving family !